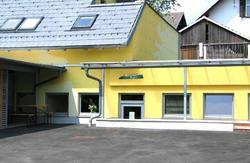 Youth Hostel Bledec is completely renovated and has been continuing a 80 - year old tradition of youth tourism at Bled. The location of the hostel is absolutely great!!! The hostel is situated in a peaceful old part of town just a minute from St. Martin church. A 5 minute walk brings you to the lake. The walking path next to the hostel takes you to the castle within less than 10 minutes. Train station is 20 minutes away (walking) and you can get to the bus station in less then 5 minutes. There is also a grocery store on the corner, just a minute away. Great pubs, bars and restaurants are all nearby. You can book several activities (rafting, cannoning, and horse riding...), trips to some highlights of Slovenia or get useful information regarding Bled and surroundings at the reception desk. The staff are nice and friendly and always ready to help.The restaurant in the hostel is open at lunch and dinner time and offers various a la cart dishes (yummy pasta) as well as set menus. The capacity of the hostel is 12 rooms with 55 beds, mostly 3,4 or 5 beds per unit, with shower and WC, TV, restaurant, bar, common room, internet, free parking, laundry service and so on. Rooms are nice and clean and are also appropriate for families with children. Hostel is appropriate for groups ( max 55 pax ). We offer bed and breakfast or even half board if you stay 3 nights or more. On foot: From the main bus station in Bled walk up the hill on the left side. Youth hostel Bledec is situated on the top of the hill. Walking distance 5 minutes. With the car: by the traffic lights in the center of Bled turn right, continue along the main road (follow directions for the castle). Shortly after passing stadium on your right, turn left up the hill ( look for sign Pension - Youth Hostel Bledec ). On the top of the hill you'll find us.